Home > Free > Bic Coupon | Money Maker on Pens at Walmart! 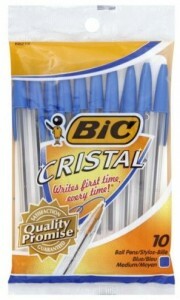 Bic Coupon | Money Maker on Pens at Walmart! This new Bic coupon for stationary items will not last long! Hurry and print your copies now for a money maker on pens at Walmart! You can also get FREE white out at Dollar Tree. Makes it a 3¢ Money Maker!